The main consideration when choosing a gas fire is you need to know what type of chimney or flue you have, because certain gas fires will only work with certain types of chimneys or flues. Your property could have a flue, chimney or none at all, although it is still possible to purchase a fire for all of these situations. Flue type is the most important starting point, as this determines the depth that you have available for your inset gas or electric fire. We have provided the following information with pictures to explain the different flue types and alternatives available to you, which can be determined by looking at your roof. However whilst the pictures and information below may be of help to you, the only reliable way of establishing what chimney or flue type you have is have an on site professional survey carried out by a Corgi registered gas installer which we always recommend. This should be done in all cases to check the compatibility of your chimney or flue with the type of appliance you intend to purchase, prior to making any final decision to avoid disappointment and additional unforeseen expense, which we cannot accept, any liability for on your behalf. A brick chimney is easily recognised by a chimneystack, with either a pot or gas terminal on your roof, which relies on the natural circulation of air through the room and up your chimney to expel the products of combustion. The minimum internal diameter will be 7inch or greater and it may have had a real solid fuel fire in previously, especially in the case of older properties sometimes identifiable by an existing chair brick at the back of the fire opening. If you have a chimney (class 1 flue) you will be pleased to know that you will be able to have most types of inset gas or electric appliances installed as well as solid fuel. These are usually a metal interlocking single or twin wall flue pipe connected to a flue box, with a gas terminal on your roof. Creating the same circulation of air as a chimney. A flue pipe with a minimum internal diameter of 7inch or more is recognised as a class 1 flue and a flue pipe of less than 7inch generally around 5inch internal diameter is recognised as a class 2 flue. Again there is both a large selection of gas appliances for class 1 & 2 applications available, dependant on the size of flue and flue box you have in your property. 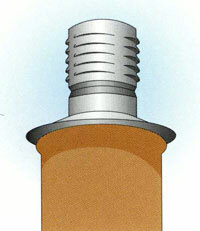 The most common is a gas cowl as illustrated below. 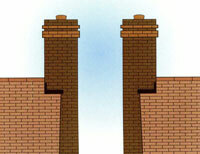 Many new properties that do not have chimneys are fitted with Pre-cast flues. This flue is manufactured into rectangular hollow concrete or clay blocks that travel vertically, up through the cavity wall of your property, to a ridge vent or metal flue terminal on the roof. These flues tend to be very shallow in depth, although suitable deeper appliances may be able to be installed with the use of either a spacer kit or deeper rebate on the fireplace. 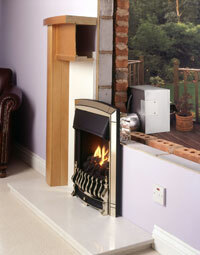 A power flue fire is available for new homes built without a chimney or older properties where the flue is no longer of sound integrity The fire is an open fronted gas appliance with an electronically driven fan system either semi recessed or surface mounted on the outside of the wall to expel the flue gases and as such a sound is to be experienced when the fan is turned on. 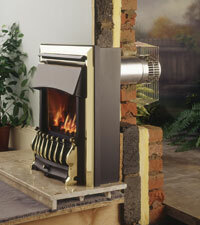 When the fire is not in use, some natural air circulation may occur through the flue terminal, which is quite normal. There are two types of power flue options available, a rear flue or side flue for left and right applications in instances where it is not possible to rear flue through the chosen wall (conditions apply). It may also be possible to install a deep power flue gas fire for added realism, subject to the depth of rebate on a surround if applicable or if installed with a spacer kit where available. A balanced flue is a glass fronted gas appliance, which is completely sealed from the room into which they are installed and vents directly to an outside wall. Air is drawn in from the outside for combustion purposes increasing its efficiency through an outer pipe whilst the inner pipe vents the combustion gases safely away to the outside of the property. There is no electric supply required; hence no sound or natural air circulation is experienced as with a power flue appliance. 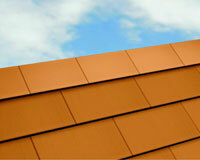 There is also a choice of either outset or inset versions available. Flueless appliances have been around for some time and incorporate the latest in gas fire technology using a catalytic converter, which the combustion gases pass through converting all harmful gases into carbon dioxide and water vapour. Therefore the fire needs no flue at all. The result is an appliance, which is 100% efficient with low running costs. Flueless appliances can be easily installed into most rooms providing there is a gas supply, excluding bedrooms & bathrooms and the room meets the minimum size and ventilation requirements. An open able window or louvre is also required in the room into which the appliance is installed. There is a choice of both free standing and inset models available. We recommend that a fireguard be used where children and the elderly are present. We advise that our products are installed and serviced annually by a Gas Safe registered engineer. Please ensure you take the time to read all the detail contained in this section in relation to your existing flue circumstances before you proceed to purchase any appliance from us. Failure to do so could lead to you incurring additional costs in the return of any goods wrongly ordered by you which we will not accept any responsibility for on our part.